By Richard PrinceThe fallout from the George Zimmerman trial was in the air Friday, as President Obama made a surprise speech about the verdict in the White House press briefing room. But at the National Native Media Conference in Tempe, Ariz., where the Native American Journalists Association was meeting, other topics ruled the day. The words "George Zimmerman" or "Trayvon Martin" were hardly uttered. "This is typical," Hughes-Juan said of the way justice was administered in the Martin case. "Being followed around in stores, stuff like that. We have so many issues, poverty issues, day-to-day survival." Native Americans rank near the bottom on so many social indicators that "a lot of this one is Native people are always dealing with our own issues," Perci Ami, a Hopi master trainer and facilitator who came to the convention in place of an ailing Patty Talahongva, a past NAJA president. If Martin had been an Indian, "We would have responded the way African American people are responding. That's probably the main reason you don't see a lot of discussion." By Vorris L. NunleyConsider Zimmerman’s vigilante “stand your ground” pose as a trope. The power of the trope emerging from the American electricity of rugged individualism, the right to bear arms, private property, and the protection of the American project of progress requiring the civilizing or disciplining of the uncivilized, the savage, the foreigner, and the criminal. Why did the vigilante trope work to perfection for Zimmerman? The vigilante trope is White. It is raced, gendered and classed. Does anyone believe that if the victim were White, a Black male could adopt the vigilante pose to equal effect? That an Asian could? A lesbian? A poor Black woman? Tropes influence human behavior almost as much as human behavior influence the use of tropes. Zimmerman was performed by the trope. It took over his body as Zimmerman exuded the arrogance, confidence, and racial tone-deafness the trope demands. Both his individuality and his Whiteness were evoked and protected by the trope. Unfortunately the Black trope erased Trayvon’s individuality. Transformed his Blackness into spectacle. Trayvon the person, the human being, rarely entered the courtroom. The defense was unwilling to skirmish with the Trayvon invented by Zimmerman: Trayvon as King Kong in a hoodie: savage, undomesticated, prone to violence, guilty by definition; George Zimmerman as Fay Wray: fragile, scared, driven to self-defense, innocent through skin. The prosecution tapped into the galvanizing energy of the Black trope with such brio that the defense lawyers seemed to be Moot Court scrubs. The misbehaving Black body (that is, any Black body challenging White notions of proper Black civility and decorum in fact or in fearful projection) is by definition wrong, needing to be quelled and made to behave, often by calling the police to say how “scared” they were, how they feared for their safety. By Robin D. G. Kelley[I]t would be a mistake to place the verdict at the feet of the defense for its unscrupulous use of race, or to blame the prosecution for avoiding race, or the jury for insensitivity, or even the gun lobby for creating the conditions that have made the murder of young black men justifiable homicide. The verdict did not surprise me, or most people I know, because we’ve been here before. We were here with Latasha Harlins and Rodney King, with Eleanor Bumpurs and Michael Stewart. We were here with Anthony Baez, Michael Wayne Clark, Julio Nunez, Maria Rivas, Mohammed Assassa. We were here with Amadou Diallo, the Central Park Five, Oscar Grant, Stanley “Rock” Scott, Donnell “Bo” Lucas, Tommy Yates. We were here with Angel Castro, Jr. Bilal Ashraf, Anthony Starks, Johnny Gammage, Malice Green, Darlene Tiller, Alvin Barroso, Marcillus Miller, Brenda Forester. We’ve been here before with Eliberto Saldana, Elzie Coleman, Tracy Mayberry, De Andre Harrison, Sonji Taylor, Baraka Hall, Sean Bell, Tyisha Miller, Devon Nelson, LaTanya Haggerty, Prince Jamel Galvin, Robin Taneisha Williams, Melvin Cox, Rudolph Bell, Sheron Jackson. And Jordan Davis, killed in Jacksonville, Florida, not long after Trayvon Martin. His murderer, Michael Dunn, emptied his gun into the parked SUV where Davis and three friends sat because they refused to turn down their music. Dunn is invoking “stand your ground” in his defense. The list is long and deep. In 2012 alone, police officers, security guards or vigilantes took the lives of 136 unarmed black men and women—at least twenty-five of whom were killed by vigilantes. In ten of the incidents, the killers were not charged with a crime, and most of those who were charged either escaped conviction or accepted reduced charges in exchange for a guilty plea. And I haven’t included the reign of terror that produced at least 5,000 legal lynchings in the United States, or the numerous assassinations—from political activists to four black girls attending Sunday school in Birmingham fifty years ago. By Mark KarlinTrayvon Martin is dead because he followed the letter of the racist ALEC-NRA "license to murder law" and protected himself against an unstoppable, insatiable deadly force: George Zimmerman. But "Stand Your Ground" laws aren't meant to give blacks the same rights as non-blacks; quite the opposite, they are, as they did in the case of George Zimmerman, meant to give whites (or half-whites in this case) the right to pursue blacks with impunity. 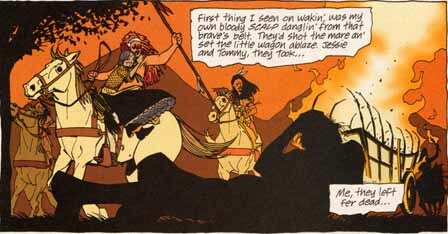 Historically, if we go back to the founding and expansion of what is now the United States, if there had been a legal entity existing at that time, Native Americans (as the illustration for this article points out) would have been entitled to stand their ground against the colonizers from Europe who were stealing their land and massacring them. We would be subject to Native American law right now if indigenous tribes had had the enforced right to stand their ground as European conquerors expanded westward, creating what is now the United States. There would have been no development of the Southern tyranny and abomination of slavery, which imported Africans as property and the source of wealth for aristocratic plantation owners. There would have likely, ironically, been no "Stand Your Ground" laws aimed at de facto allowing the murder of non-whites as BuzzFlash at Truthout wrote about in a July 6 column, "It's Not Just George Zimmerman on Trial, It's America's Acceptance of Killing 'the Other'. "Comment: For more on Trayvon Martin, see Zimmerman Verdict Shows America's Pathology and Racism in Post-Trayvon America.